Want to get more clients for your agency? It’s not always as easy as you’d like. When you’re focused on providing quality marketing services for your clients, it’s easy to let your own marketing slip through the cracks. It doesn’t help that smaller agencies rarely have the resources to hire a dedicated Business Development Manager and most new leads take months to convert. What’s the fastest way to get more clients? Leverage your best resource — your existing clients. Recommendations from satisfied customers are incredibly powerful and go a long way in establishing trust faster, leading to a quicker conversion time. You can create credibility by highlighting happy customers on your website and including a few customer quotes on your homepage. 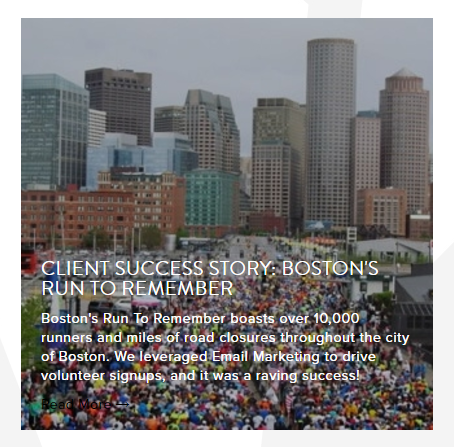 Go a step further by publishing some full customer success stories on your blog. Don’t shy away from asking for referrals. If your clients are happy with the service you’re providing, sending a quick email might be all they need to recommend your business to their friends and peers. 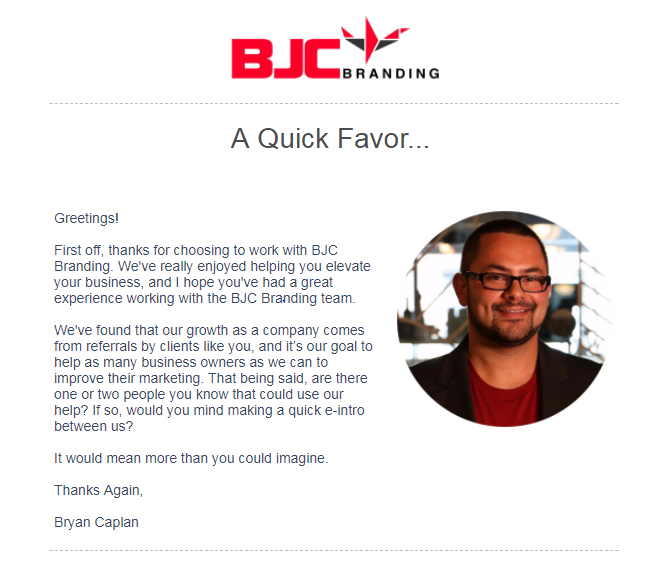 In the email below, BJC’s founder, Bryan Caplan drove 26 client referrals that translated into three new sales. Additionally, the email awakened some of his dormant clients — resulting in another five sales from existing clients. Next, think about the people already seeking your services out. These days, when someone is researching a product or service, their first step is usually a search engine. With 81 percent of people conducting online research before making a purchase, you want to have a healthy relationship with search engines. Make sure your website is optimized for the keywords related to the specific marketing services you provide. And once people land on your website, encourage them to stay in touch with you by signing up for your email list. Add a sign-up form to your website and encourage visitors to give you their email address in exchange for a valuable piece of content, like an ebook or guide. 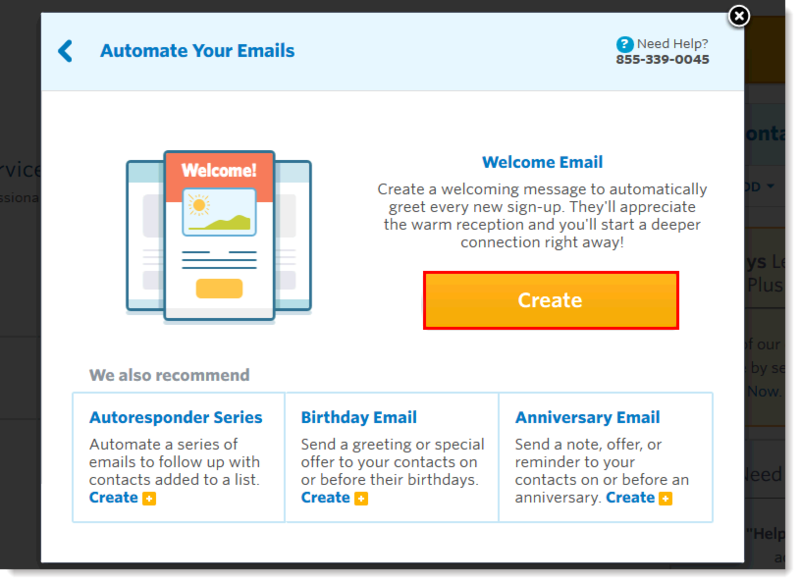 Now, nurture new leads with an automated welcome series. Getting more clients starts with getting more leads. But if you’re not following up with new leads in a timely manner, they’ll lose interest. The easiest way to effectively follow up with new leads is through an Automated Welcome Series. Email services, like Constant Contact, make it easy to automatically send emails to new contacts added to a specific email list. Start with a Welcome Email that fulfills your promise of any content/offer you promoted at the point of sign-up. Then, set up two additional emails to send in the next few days. This is your chance to introduce your business, establish your values, and delve into your specialties. Your welcome series might be the perfect place to repurpose one of your best case studies and reinforce how your business drives client success. In each email in your series, provide a strong call to action and make it incredibly easy for new leads to get in touch with you or schedule a call to learn more. Getting more clients isn’t a cakewalk. But with a plan to leverage your existing clients and effectively capture and nurture leads through your website, you’ll get more clients coming your way in no time. Get more leads with the help of a trusted partner. At Constant Contact, we help marketing agencies get in front of new clients that are looking for your area of expertise. You’ll get a dedicated Account Manager, access to professional marketing tools and training, and increased exposure for your agency. Learn more about our Solution Provider Program here.